This article is about the historic road of the United States. For other uses, see National road. The National Road (also known as the Cumberland Road) was the first major improved highway in the United States built by the federal government. Built between 1811 and 1837, the 620-mile (1,000 km) road connected the Potomac and Ohio Rivers and was a main transport path to the West for thousands of settlers. When rebuilt in the 1830s, it became the second U.S. road surfaced with the macadam process pioneered by Scotsman John Loudon McAdam. Construction began heading west in 1811 at Cumberland, Maryland, on the Potomac River. After the Financial Panic of 1837 and the resulting economic depression, congressional funding ran dry and construction was stopped at Vandalia, Illinois, the then capital of the Illinois, 63 miles (101 km) northeast of St. Louis across the Mississippi River. Today, much of the alignment is followed by U.S. Route 40, with various portions bearing the Alternate U.S. Route 40 designation, or various state-road numbers (such as Maryland Route 144 for several sections between Baltimore and Cumberland). In 2002, the full road, including extensions east to Baltimore and west to St. Louis, was designated the Historic National Road, an All-American Road. The Braddock Road had been opened by the Ohio Company in 1751 between Fort Cumberland, the limit of navigation on the upper Potomac River, and the French military station at Fort Duquesne at the forks of the Ohio River, (at the confluence of the Allegheny and Monongahela Rivers), an important trading and military point where the city of Pittsburgh now stands. It received its name during the colonial-era French and Indian War of 1753–63 (also known as the Seven Years' War in Europe), when it was constructed by British General Edward Braddock who was accompanied by Colonel George Washington of the Virginia militia regiment in the ill-fated July 1755 Braddock expedition, an attempt to assault the French-held Fort Duquesne (later the city of Pittsburgh, Pennsylvania). Construction of the Cumberland Road (which later became part of the longer National Road) was authorized on March 29, 1806, by President Thomas Jefferson. The new Cumberland Road would replace the wagon and foot paths of the Braddock Road for travel between the Potomac and Ohio Rivers, following roughly the same alignment until just east of Uniontown, Pennsylvania. From there, where the Braddock Road turned north towards Pittsburgh, the new National Road/Cumberland Road continued west to Wheeling, Virginia (now West Virginia), also on the Ohio River. Beyond the National Road's eastern terminus at Cumberland and toward the Atlantic coast, a series of private toll roads and turnpikes were constructed, connecting the National Road (also known as the Old National Pike) with Baltimore, then the third-largest city in the country, and a major maritime port on Chesapeake Bay. Completed in 1824, these feeder routes formed what is referred to as an eastern extension of the federal National Road. On May 15, 1820, Congress authorized an extension of the road to St. Louis, on the Mississippi River, and on March 3, 1825, across the Mississippi and to Jefferson City, Missouri. Work on the extension between Wheeling and Zanesville, Ohio, used the pre-existing Zane's Trace of old Ebenezer Zane, and was completed in 1833 to the new state capital of Columbus, Ohio, and in 1838 to the college town of Springfield, Ohio. In 1849, a bridge was completed to carry the National Road across the Ohio River at Wheeling. 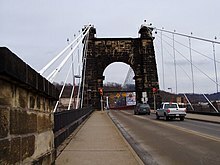 The Wheeling Suspension Bridge, designed by Charles Ellet Jr., was at the time the world's longest bridge span at 1,010 feet (310 m) from tower to tower. Maintenance costs on the Cumberland Road were becoming more than Congress was willing to bear. In agreements with Maryland, Virginia, and Pennsylvania, the road was to be reconstructed and resurfaced. The section that ran over Haystack Mountain, just west of Cumberland, was abandoned and a new road was built through the Cumberland Narrows. On April 1, 1835, the section from Wheeling to Cumberland was transferred to Maryland, Pennsylvania, and Virginia (now West Virginia). The last congressional appropriation was made May 25, 1838, and in 1840, Congress voted against completing the unfinished portion of the road, with the deciding vote being cast by Henry Clay. By that time, railroads were proving a better method of long-distance transportation, and the Baltimore and Ohio Railroad was being built west from Baltimore to Cumberland, mostly along the Potomac River, and then by a more direct route than the National Road across the Allegheny Plateau of West Virginia (then Virginia) to Wheeling. Construction of the National Road stopped in 1839. Much of the road through Indiana and Illinois remained unfinished and was later transferred to the states. In 1912, the Cumberland National Road was chosen to become part of the National Old Trails Road, which would extend further east to New York City and west to Los Angeles, California. 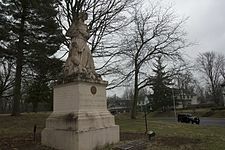 Five Madonna of the Trail monuments, donated by the Daughters of the American Revolution, were erected along the old National Road. In 1927, the National Road was designated as the eastern part of U.S. Highway 40, which still generally follows the National Road's alignment with occasional bypasses, realignments, and newer bridges. The mostly parallel Interstate 70 now provides a faster route for through travel without the many sharp curves, steep grades, and narrow bridges of U.S. 40 and other segments of the National Road. However, between Hancock in western Maryland and Washington, Pennsylvania, I-70 takes a more northerly path to connect with and follow the Pennsylvania Turnpike (also designated as I-76) across the mountains between Breezewood and New Stanton, where I-70 turns west to rejoin the National Road's route (and U.S 40) near Washington, Pennsylvania. The more recently constructed Interstate 68 parallels the old road from Hancock through Cumberland west to Keyser's Ridge, Maryland, where the National Road and U.S. 40 turn northwest into Pennsylvania, but I-68 continues directly west to meet Interstate 79 near Morgantown, West Virginia. The portion of I-68 in Maryland is designated as the National Freeway. Casselman River Bridge near Grantsville, Maryland – Built in 1813–1814 to carry the road across the Casselman River, it was the longest single-span stone arch bridge in the world at the time. Great Crossings Bridge near Confluence, Pennsylvania – Built in 1818 to carry the road over the Youghiogheny River, the bridge, and the adjacent town of Somerfield, Pennsylvania (which was razed) are under the waters of Youghiogheny River Lake (though still visible at times of extremely low water levels). Another remaining National Road bridge is the Wheeling Suspension Bridge at Wheeling, West Virginia. Opened in 1849 to carry the road over the Ohio River, it was the largest suspension bridge in the world until 1851, and is today the oldest vehicular suspension bridge in the United States still in use. A newer bridge now carries the realigned U.S. 40 and I-70 across the river nearby. Additionally, several mile markers—some well-maintained, others deteriorating, and yet others represented by modern replacements—remain intact along the route. In general, the road climbed westwards along the Amerindian trail known as Chief Nemacolin's Path, once followed and improved by a young George Washington, then also followed by the Braddock Expedition. Using the Cumberland Narrows, its first phase of construction crossed the Allegheny Mountains entered southwestern Pennsylvania, reaching the Allegheny Plateau in Somerset County, Pennsylvania. There, travelers could turn off to Pittsburgh or continue west through Uniontown and reach navigable water, the Monongahela River, at Brownsville, Pennsylvania, which was by then a major outfitting center and riverboat-building emporium. Many settlers boarded boats there to travel down the Ohio and up the Missouri, or elsewhere on the Mississippi watershed. By 1818, travelers could press on, still following Chief Nemacolin's trail across the ford, or taking a ferry to West Brownsville, moving through Washington County, Pennsylvania, and passing into Wheeling, Virginia (now West Virginia), 45 miles (72 km) away on the Ohio River. Subsequent efforts pushed the road across the states of Ohio and Indiana and into the Illinois Territory. The western terminus of the National Road at its greatest extent was at the Kaskaskia River in Vandalia, Illinois, near the intersection of modern U.S. 51 and U.S. 40. Today, travelers driving west from Vandalia travel west along modern U.S. 40 through south-central Illinois. The National Road continued into Indiana along modern U.S. 40, passing by the cities of Terre Haute and Indianapolis. Within Indianapolis, the National Road used the original alignment of U.S. 40 along West Washington and East Washington Streets (modern U.S. 40 is now routed along I-465). East of Indianapolis, the road went through the city of Richmond before entering Ohio, where the road continued along modern U.S. 40 and passed through the northern suburbs of Dayton, Springfield, and Columbus. West of Zanesville, Ohio, despite U.S. 40's predominantly following the original route, many segments of the original road can still be found. Between Old Washington and Morristown, the original roadbed has been overlaid by I-70. The road then continued east across the Ohio River into Wheeling in West Virginia, the original western end of the National Road when it was first paved. After running 15 miles (24 km) in West Virginia, the National Road then entered Pennsylvania. The road cut across southwestern Pennsylvania, heading southeast for about 90 miles (140 km) before entering Maryland. East of Keyser's Ridge, the road used modern Alternate U.S. 40 to the city of Cumberland (modern U.S. 40 is now routed along I-68). Cumberland was the original eastern terminus of the road. In the mid-19th century, a turnpike extension to Baltimore—along what is now Maryland Route 144 from Cumberland to Hancock, U.S. 40 from Hancock to Hagerstown, Alternate U.S. 40 from Hagerstown to Frederick, and Maryland Route 144 from Frederick to Baltimore—was approved. The approval process was a hotly debated subject because of the removal of the original macadam construction that made this road famous. The road's route between Baltimore and Cumberland continues to use the name National Pike or Baltimore National Pike and as Main Street in Ohio today, with various portions now signed as U.S. Route 40, Alternate U.S. 40, or Maryland 144. A spur between Frederick, Maryland, and Georgetown (Washington, D.C.), now Maryland Route 355, bears various local names, but is sometimes referred to as the Washington National Pike; it is now paralleled by Interstate 270 between the Capital Beltway (I-495) and Frederick. Dunlap's Creek Bridge, near Brownsville, Pennsylvania, the first cast iron arch bridge in the United States. Completed in 1839, it was designed by Richard Delafield and built by the United States Army Corps of Engineers. Still in use, the bridge is also a National Historic Civil Engineering Landmark. The Pennsylvania Historical and Museum Commission has installed five historical markers noting the historic importance of the road: one in Somerset County on August 10, 1947, one in Washington County on April 1, 1949, and three in Fayette County on October 12, 1948, October 12, 1948, and May 19, 1996. ^ Hulbert, Archer B. (1920). Johnson, Allen; Jefferys, Charles W.; Lomer, Gerhard R., eds. The Paths of Inland Commerce: a chronicle of trail, road, and waterway (online digital auto-scanned reproduction) (Textbook). The Chronicle of America Series (Textbook ed.). New Haven, Toronto, London: Yale University Press and two others. ^ "Bird's Eye View of Cumberland, Maryland 1906". World Digital Library. 1906. Retrieved 2013-07-22. ^ "The National Road - Back in Time - General Highway History - Highway History - Federal Highway Administration". www.fhwa.dot.gov. Retrieved 2019-02-25. ^ "U.S. Transportation Secretary Mineta Names 36 New National Scenic Byways, All-American Roads (6/13/02)". Fhwa.dot.gov. Retrieved 2013-08-23. ^ "Original Contract Information For the Construction of the Cumberland Road / National Road – 1811 to 1812". The Cumberland Road Project. 2010-02-16. Archived from the original on 2014-10-13. Retrieved 2016-02-12. ^ Lowry, Patricia (January 7, 1999). "A bridge to the 19th century: Falling water-level of Youghiogheny unearths ghost town, historical crossing". The Pittsburgh Post-Gazette. Retrieved July 17, 2017. ^ "National Road – PHMC Historical Markers". Historical Marker Database. Pennsylvania Historical & Museum Commission. Retrieved December 9, 2013. Wikimedia Commons has media related to National Road. Wikisource has the text of The New Student's Reference Work article "Cumberland Road". This page was last edited on 27 March 2019, at 18:32 (UTC).